Developing impressive delts doesn’t have to take up a ton of time in the weight room. A wide set of shoulders can set you apart from the pack. They invoke confidence, strength, and a sense of presence like no other bodypart. On the contrary, narrow, lifeless deltoids tell the exact opposite story. Not only will underdeveloped shoulders expose your lack of muscle but also the way others perceive your first impression. Like it or not, the way we look is usually how someone initially judges us. The good news is that no matter where you start, more width is a reachable goal. Whether you own a set of wide or narrow clavicles, you can always manage to pack on more muscle to complement your V-taper and look instantly larger. But what about those of us who are short on time or maybe need a new and interesting way to get there? Maybe you’re tired of the same old shoulder routine of presses, side laterals, and bent-over raises and are in need of something fast and furious and effective. Many gym-goers set up their shoulder workouts either on separate days or paired up with another small bodypart such as biceps or triceps. They believe their deltoids need an entire day to be pummeled into the ground while leaving no stone (read: muscle fiber) unturned. Although this strategy may work for some, others have a hard time with this traditional approach. Heavy sets of dumbbell and barbell overhead presses have been the staple and dogma of so many lifters that it has become standard practice. If you want big shoulders, you need to press heavier weight. As stated earlier, for those of us who have a limited amount of time or just want something new, the traditional practice of perform a set, rest, perform another set, just won’t cut it. You may not only need to adopt a new program, you also may need a new perspective as well. Not everyone is blessed with the potential to easily pack on shoulder mass, much less do it with traditional bodybuilding-style training. You may need to think of shoulder training a bit differently and cater your training accordingly. Just take a look at male gymnasts: They all have deltoid development envied by the average physique athlete—perfectly rounded shoulder caps that are proportionate and not to mention strong. But you’ll be hard-pressed to find a gymnast pumping out endless sets of seated dumbbell presses or side lateral raises. Instead, they subject their shoulders to mostly high-rep, high-tension bodyweight movements for hours and hours per day. It almost seems contradictory that they’ve built massively developed shoulders without picking up a dumbbell. Now, of course, it’s not that practical for you to join a gymnastics team in place of your gym workouts, but you can take away a few key points. One being that the principle of time under tension is in full effect. You’ll have to make your sets last anywhere from 30 seconds to one minute. Secondly, you’ll need to be willing to perform high-rep sets with little to no rest in between. This can be done by using supersets and giant sets. Simple in theory but challenging to practice. Notice I didn’t say anything about heavy presses or low reps. 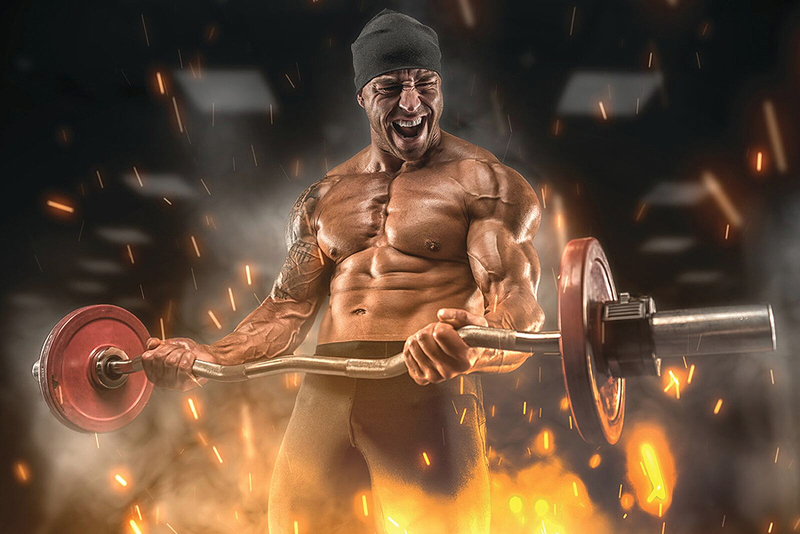 This is a totally different mindset that will pump enormous amounts of blood into your deltoids and take you to another level when it comes to feeling the burn. Choose any two shoulder exercises and perform 100 reps for each. Be sure that all sets are done for 10 reps or more. Rest as needed, and complete as many sets as you need until 100 reps is achieved. Shoot to complete both exercises within a 15-minute window. For kettlebell side lateral raises, be sure to perform each rep slower than you would with a dumbbell. This is out of pure necessity because the kettlebell will feel more unstable. Raise the weight to shoulder height, then return to your side without a pause. For the single-arm variation, hold onto a stationary piece of equipment for added stability. Start by raising the weight straight out to your side and return to your hip rather than in front of you. Avoid swinging the weight up at all costs. Grab a D-handle and raise the weight straight out to your side. Allow the handle to travel in front of your body. When the arm reaches shoulder height, pause and squeeze the muscle in a peak contraction. Return slowly while keeping an upright posture. With your upper body parallel with the floor and slightly bent but rigid elbows, raise the weights out to your sides in line with your deltoids. Squeeze at the top once your elbows are shoulder height. Lower slowly and avoid any bouncing or swinging. Connect a rope to a cable apparatus approximately head height. Grab each end of the rope with your elbows out to the sides. Pull the rope toward your forehead and squeeze your deltoids for an intense contraction for a count. Lower the weight in a slow and controlled manner. Sit on a lat pulldown station with a wide bar attached to the cable overhead. Take a wider than normal grip, and with an upright posture tilt your head back looking up at the bar. With your elbows pointing straight out to your sides, pull the bar slowly down toward your face just before it touches your nose. Return slow and controlled. With the weight in your hands, stand with your feet about shoulder-width apart, slightly bent knees, and a tight core. Raise the load, letting it pass in front and just over your head level. Return under control, as this exercise will tend to make you want to swing the weight up. Grip a single dumbbell and clean it up to you shoulder to the starting position. With your other hand holding onto something stationary for stability, press the weight up without locking your elbow. Return to the bottom position and repeat for reps. Once all reps are completed for one side, switch to the other. Shrugs are just that: a shrug. Whether you’re holding a dumbbell, barbell, or using a machine, avoid rounding and grinding your shoulders in a circular motion. Simply shrug the weight up, squeeze for a count and then slowly lower the weight straight down. Grab a pair of dumbbells while standing and position them on the front of your thighs with your palms facing behind you. Pull the dumbbells up with your elbows high and to your sides. The dumbbells should travel along the front of your upper body. Stop once your elbows are just above your shoulders and then return to the starting position.